"Who has not, at the sight of some glorious vista, echoed the poet's profound sentiment? Before we ever began to build temples in His honor, God graced us with natural sanctuaries radiant with the light of divine love and peace. In the crowded and busy world most of us live in, there is little enough time to seek out the secluded treasures that give testimony to a divine presence in the world. The Mountain Chapel, first in the series, is a rough-hewn stone chapel sculpted out of the very granite of the mountains that rise behind. As the mirror-bright lake reflects the majesty of God's glorious creation, the chapel, bathed in golden sunlight, reflects the generosity of His plan for man. As my Chapels of Nature series unfolds, we will seek the presence of God in His lakes, forests, hills, and valleys. It is my prayer that we will find Him together." 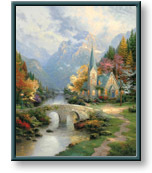 The Mountain Chapel copyright&opy; 1998 by Thomas Kinkade is prohibited from being copied.